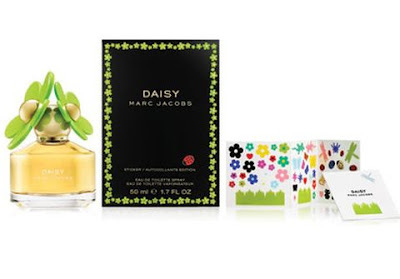 I was a little surprised when Marc Jacobs came out with Daisy perfume. The couple of Marc perfumes I own are a bit "mature" compared to this fragrance. I love it when MJ thinks he can top himself. For Spring, he is releasing the Daisy Bloom. It is coming out sometime this month, and smells like the original. The bottle comes with a green cap, and some Spring-y stickers. The stickers are not a selling point for me. Neither the cap. I am comfortable dressing like a ten year old, and still feel like I can ride my bike without a run in my tights. However, smelling like a ten year old, that is different. For our two year anniversary (not marriage), I got the limited edish black bottle of Daisy. It is more familiar, still playful. The original Daisy scent is too sugary-candy-juvenile. I want to smell like a woman, not a pre-teen. The black bottle is grown up version of the original. Of course I fell in love with the packaging, than the name prissy name. I am completely enamored by the scent. It is feminine, whimsical, but still mature enough that I won't clash with my old man cardigans and make me feel like someone else; it's much softer than other Jacobs' fragrances. However, he can bottle the stench of toxic boiled cabbage, and I will be the consumer that falls for it. Thankfully, this one is far from that. I love this scent, and my other MJ perfumes will be set aside for a few years till I retire this one.